An hour is coming, and now is, when the true worshipers will worship the Father in spirit and truth; for such people the Father seeks to be His worshipers. God is Spirit, and those who worship Him must worship in spirit and in truth. When Adam sinned in disobedience to God he immediately died, spiritually. The spirit of Adam – the essential part of his being that communicated with God, died. Ever since that first spiritual death all humanity have been born dead in their sin. Every member of the human race since Adam is born out of fellowship with God. Every man and woman since creation has no capacity to fellowship with the Lord. The immovable barrier between God and man was demolished by the Man, Christ Jesus. The veil of the temple.. separating man from God was torn asunder by the Lord Jesus, but only a believer has the capacity to come before the throne of grace – through Christ. The unbeliever remains dead in their sins and estranged from their Creator God. Only a believer has a human spirit that is alive and can commune with the Holy Spirit. – but man did not have access to God, for sin separated fallen man from a holy God. But Jesus told the woman at the well: an hour is coming, and now is, when the true worshipers will worship the Father in spirit and truth, John 4:24 The point in history when man could worship God in spirit and truth – was the cross. Temple worship and sacrifices, which pointed to Christ – were set aside at the cross, and from that pivotal point in history, God would be worshipped in spirit and truth: for God is spirit, and those who worship Him must worship Him in spirit and truth. Our heavenly Father regards those that worship in spirit and truth as true worshippers. 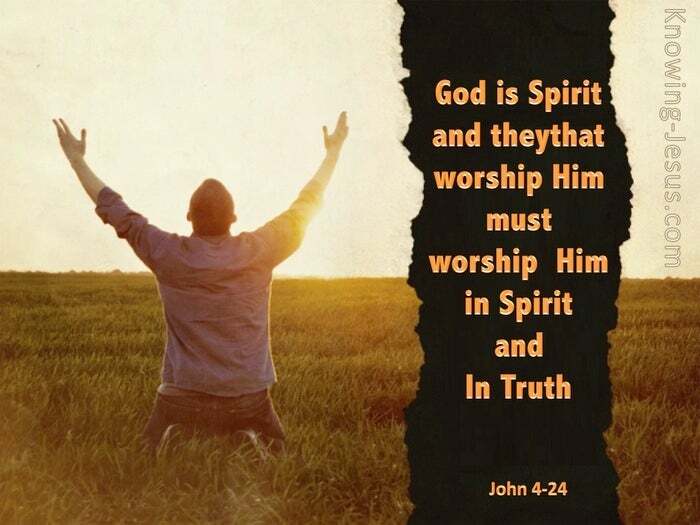 How important therefore to worship the Lord our God in spirit and truth. How important that we worship in the only way that is acceptable to the Father. 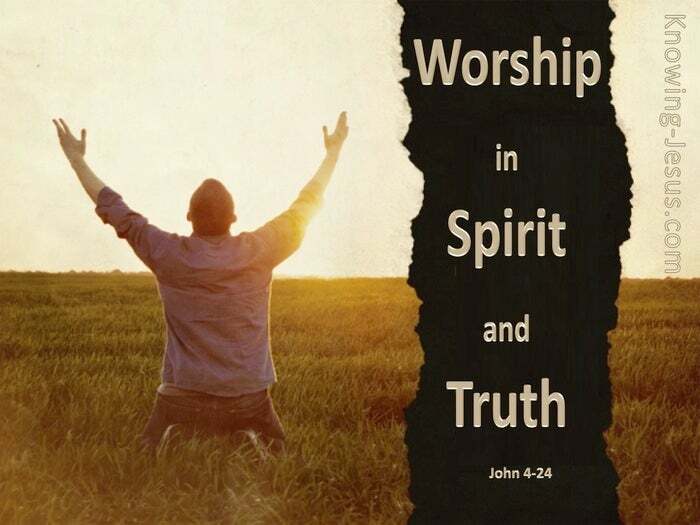 But how do we worship the Lord in spirit and truth? How can we know that we are worshiping in a manner that is acceptable to the Lord? Well, at rebirth we are born into a new creation in Christ – we are given a new nature. Baby Christians must grow. Our new nature must be conformed to be like Christ. The old sin nature must remain crucified and our flesh must remain on the cross, for our fleshly sin nature can never fellowship with the indwelling Holy Spirit. Our old sin nature walks in the lusts of the flesh and not in spirit and truth. Only our new nature, born of the Spirit can worship the Father in spirit and truth. Our new nature in Christ must grow. Our new life in Christ must develop and mature, and our new man will grow and mature as we submit to the indwelling Holy Spirit. Only our new nature can fellowship with the Lord. Only our new nature is alive. Only the new life can function in the spiritual realm and commune with the Holy Spirit. Only our new life in Christ is spiritually alive and can worship in spirit and truth, for God is Spirit, and those who worship Him must worship in spirit and in truth.